Full of texture and streamlined details, this rectangular wall mirror creates depth in a cool gray tone. Add depth with the raised square pieces from the frame of this rectangular wall mirror. From Howard Elliott, the wooden frame is streamlined with a rustic gray stain over pyramid squares. Beveled glass is smooth and creates a luxurious feel, great for any classic space. Install vertically or horizontally using the D-ring hangers on the back. 30" wide x 42" high x 2" deep. Hang weight is 33 lbs. Glass only section is 18" wide x 30" high. 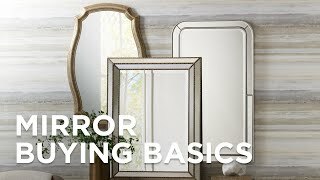 Dakota rectangular wall mirror from Howard Elliott. Can be installed vertically or horizontally. D-rings hangers on the back. Rustic gray stain pyramid squares finish. Wood frame construction. Beveled glass. Radiant wood slats from the geometric frame of this round wall mirror celebrate multidimensional visual texture.